Title Bank-Rescue Plan Is Under Review published to cocoa-touch. U.S. lawmakers are reviewing a tentative agreement to revive credit markets by authorizing a $700 billion plan to buy troubled assets from financial institutions. ``The deal is done,'' Senator Judd Gregg, a New Hampshire Republican, a ranking member of the Budget Committee, said this morning. The House and Senate may vote tomorrow, Gregg said. Still, Republican House members are waiting to see the compromise proposal written into legislation before making a final decision to support it, said Representative Eric Cantor of Virginia. ``We're waiting to see what this looks like on paper to see if we have an agreement,'' Cantor said. The negotiations were completed about midnight when lawmakers agreed to require the president to offer a plan to recoup any loss to the taxpayers after five years, said a Democratic congressional aide. That clause was intended to address concerns about the cost of the program. The agreement alters the Bush administration's original request for unchecked authority to purchase distressed debt securities from financial companies reeling from the record number of home foreclosures. That plan evoked a blizzard of emails and phone calls from voters outraged at being asked to foot the bill for the mistakes of Wall Street investors. Initial Cost During weeklong negotiations, lawmakers reduced the initial cost by half to $350 billion, with the remainder to be authorized later, and they added provisions creating an oversight structure and help to homeowners facing foreclosure. The compromise also includes a proposal by House Republicans, whose objections scuttled an earlier agreement in principle, that provides for government insurance for mortgage- backed securities. The plan also imposes limits on the compensation of executives at participating companies. ``It will be the first time in American history that there will be legislative restrictions on CEO compensation,'' said House Financial Services Chairman Barney Frank, Democrat of Massachusetts. ... statement Sunday saying the bank rescue is necessary. He said that "failure to deal with the current crisis would have devastating consequences for our economy, costing millions of Americans their jobs and retirement security. Significant bipartisan work has built consensus around dramatic improvements to the original Bush-Paulson plan to stabilize American financial markets -- including cutting in half the Administration's initial request for $700 billion and requiring Congressional review for any future commitment of taxpayers' funds. If the government loses money, the financial industry will pay back the taxpayers. The administration had initially requested virtually unfettered authority to operate the bailout program. But as they moved toward clinching a deal, both sides appeared to have given up a number of contentious proposals, including a change in the bankruptcy laws sought by some Democrats to give judges the authority to modify the terms of first mortgages. Congressional leaders and Treasury Secretary Henry M. Paulson Jr. emerged from behind closed doors to announce the tentative agreement at 12:30 a.m. Sunday, after two days of marathon meetings. “We have made great progress toward a deal, which will work and be effective in the marketplace,” Mr. Paulson said at a news conference in Statuary Hall in the Capitol. 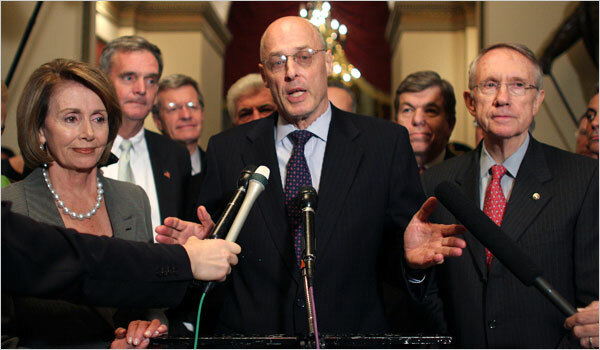 In the final hours of negotiations, Democratic lawmakers, including Representative Rahm Emanuel of Illinois and Senator Kent Conrad of North Dakota, carried pages of the bill by hand, back and forth, from Speaker Nancy Pelosi’s office, where the Democrats were encamped, to Mr. Paulson and other Republicans in the offices of Representative John A. Boehner of Ohio, the House minority leader. At the same time, a series of phone calls was taking place, including conversations between Ms. Pelosi and President Bush; between Mr. Paulson and the two presidential candidates, Senator John McCain and Senator Barack Obama; and between the candidates and top lawmakers. “All of this was done in a way to insulate Main Street and everyday Americans from the crisis on Wall Street,” Ms. Pelosi said at the news conference. “We have to commit it to paper so we can formally agree, but I want to congratulate all of the negotiators for the great work they have done.” In a statement, Tony Fratto, the deputy White House press secretary, said: “We’re pleased with the progress tonight and appreciate the bipartisan effort to stabilize our financial markets and protect our economy.” A senior administration official who participated in the talks said the deal was effectively done. “I know of no unresolved open issues for principals,” the official said. In announcing a tentative agreement, lawmakers and the administration achieved their goal of sending a reassuring message ahead of Monday’s opening of the Asian financial markets. Lawmakers, especially in the House, are also eager to adjourn and return home for the fall campaign season. Mr. Obama and Mr. McCain both expressed support for the rescue package early on Sunday, while adding that it was hardly a moment for taxpayers to cheer. “This is something that all of us will swallow hard and go forward with,” Mr. McCain said in an interview on ABC’s “This Week.” “The option of doing nothing is simply not an option.” Mr. Obama, in a statement, said: “When taxpayers are asked to take such an extraordinary step because of the irresponsibility of a relative few, it is not a cause for celebration. But this step is necessary.” The backing of the presidential candidates will be crucial to Congressional leaders seeking to generate votes for the bailout plan among lawmakers, especially those up for re-election in November. The general public has bristled at the notion of risking $700 billion in taxpayer funds to address mistakes on Wall Street, and many constituents have urged their elected officials to vote against the plan. Among the last sticking points was an unexpected and bitter fight over how to pay for any losses that taxpayers may experience after distressed debt has been purchased and resold. Democrats had pushed for a fee on securities transactions, essentially a tax on financial firms, saying it was fitting that they contribute to the cost. In the end, lawmakers and the administration opted to leave the decision to the next president, who must present a proposal to Congress to pay for any losses. Title: Palin: Bailout is about healthcare!